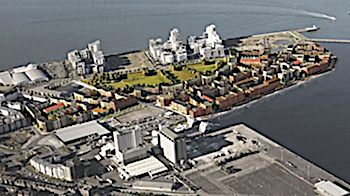 Forth Ports said a revised design framework (RDF) for a major development at Western Harbour in Leith, Edinburgh — which will result in the delivery of a community of 1,600 mid-market rental homes — was unanimously approved by the development management sub committee of City of Edinburgh Council. Forth Ports CEO Charles Hammond said: “We are pleased with the decision … by City of Edinburgh Council to approve our Revised Design Framework for Western Harbour in Leith. “Forth Ports and Rettie & Co. have been working together for over two years on these proposals that will result in the delivery of a community of 1600 mid-market rental home and park which should also create the setting for the new primary school for the area. “Through our other recently completed developments at Harbour Point and Harbour Gateway, we know there is a great deal of demand from people looking for these mid rent homes and an opportunity to create a community. “Our proposal represents a major boost for the Leith economy and for Edinburgh as a whole and we now hope for a positive outcome from the Scottish Ministers on the possible loan funding for this project. Matthew Benson, director at Rettie & Co, development managers on Western Harbour, said: “Today’s announcement marks a major milestone on the journey to create a managed Build to Rent community of critical mass in Scotland.